Why Can't We Use Secular Music During Mass? Am I crazy, or is this resemblance jarring? A few years ago, we created this video which presented Church legislation on Sacred music and drew some conclusions. Some of my friends were angry we used the term “Disney” to describe certain liturgical music. Others thought we were kidding. However, I stand behind that term, because technical descriptions like “modal” and “rhythmically free” mean nothing to the vast majority of Catholics who lack professional training in music. PLEASE, DON’T LEAVE ANY NASTY COMMENTS saying I am “anti-Schutte” or anything like that. I have absolutely nothing against Schutte, who is incredibly accomplished 2 and literally world-famous. He’s free to write whatever he wishes and folks are free to purchase it. However, I do object to certain would-be “scholarly” publications treating this music in a serious fashion, using the most outlandish psychobabble. 3 Sometimes I’m tempted to scream: “How can such things be written about a tune lifted from My Little Pony?” Just a decade ago, I believed Musicology symposia had a monopoly on this kind of gibberish — I was wrong! N.B. 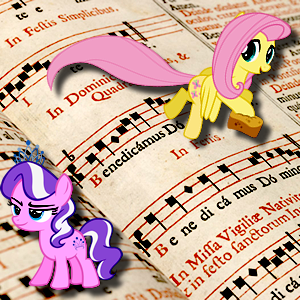 The musically-observant priest who discovered this Schutte/Pony similarity is currently Liturgy Director for a major Archdiocese in the United States. It was sent to me via email “chain letter.” This was the first time I’d ever heard Schutte’s Mass setting. 1 Musical settings which alter the official Mass texts were supposed to have been eliminated beginning in 2011. 2 Dan Schutte (b. 1947) is best known for composing the hymn “Here I Am, Lord.” He has received three honorary doctoral degrees, numerous Grammy nominations, and many other awards. He is considered one of the most influential living composers of “contemporary” Catholic liturgical music. 3 I have some examples I’ve saved over the years, but I hesitate to post them at this moment (I will explain another day).